We are quickly approaching the deadline for filing (and paying) our federal and state income taxes (extended to Tuesday, April 17 this year because April 15 falls on a Sunday and Monday is Emancipation Day), and that means it’s time for my annual post at tax time to help put things in perspective. “In the beginning,” when the US federal income tax was first introduced in 1913, it used to be a lot, lot simpler and a lot easier to file taxes; so easy in fact that it was basically like filling out your federal tax return on a postcard. For example, page 1 of the original IRS 1040 income tax form from 1913 appears above. 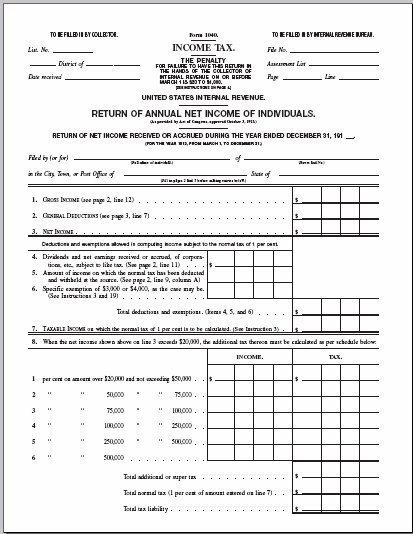 There were only four pages in the original 1040 form, including two pages of worksheets, the actual one-page 1040 form above, and only one page of instructions (view all four pages here). In contrast, just the current 1040 instructions for 2017, without any forms or schedules, runs 107 pages (forms and schedules are available separately here and here). Individual federal income tax rates started at 1 percent in 1913, and the maximum marginal income tax rate was only 7 percent on incomes above $500,000 (more than $12.7 million in today’s dollars). The personal exemption in 1913 was $3,000 for individuals (more than $76,000 in today’s dollars) and $4,000 for married couples (nearly $102,000 in today’s dollars), meaning that very few Americans had to pay federal income tax since the average annual income in 1913 was only about $750. The Tax Foundation has historical federal income tax rates for every year between 1913 and 2013 here for tax brackets expressed in both nominal dollars and inflation-adjusted dollars and the 2017 tax brackets here. In a 2012 report to Congress (most recent data available), the National Taxpayer Advocate estimated that American taxpayers and businesses spend 6.1 billion hours every year complying with the income tax code, based on IRS estimates of how much time taxpayers (both individual and businesses) spend collecting data for, and filling out their tax forms. In addition, Americans will spend an estimated $10 billion for the services of tax preparation firms and $2 billion on tax-preparation software programs like TurboTax that still require many hours of time. The amount of time spent for income tax compliance—6.1 billion hours—would be the equivalent of more than 3 million Americans working full-time, year-round (or 2 percent of total US payrolls of 148.2 million). By way of comparison, the federal government currently employs 2.8 million full-time workers, and Wal-Mart, the world’s largest private employer, currently employs 2.2 million workers worldwide and 1.3 million workers in the US (both full-time and part-time). At the current average hourly wage of $22.42 an hour, the dollar value of the opportunity cost associated with tax filing would be $136.7 billion, which is more than the GDP of 18 US states last year.